Deaths and funerals are a delicate and emotional life event. They are a time to grieve over the loss of a loved one and remember all the fond memories with the deceased. Traditionally, flowers are sent to either the funeral home or residential home, as beautiful representations of love and sympathy which exude beauty and life. Although we know we want to express certain feelings, we may be unsure of what is or is not appropriate to send to a funeral. With a variety of different kinds of flowers that can be sent, we have put together a short guide to provide helpful information. From types of arrangements to who should send them, read on for more. Standing sprays should be delivered to the funeral home and are often formal and larger than standard floral arrangements. They are dedicated to the deceased serving as a sign of respect for the one who passed away. Standing sprays are also a good choice if you are unsure of how the setup will be, as they are placed on an easel, which can easily be moved if needed. It is tradition that standing sprays are ordered and sent by immediate and extended family members of the deceased. Send your deepest condolences with this classic white floral spray. White carnations, monte casino blooms, mums, and snapdragons are accented with lush greens and arranged onto a standing spray easel. 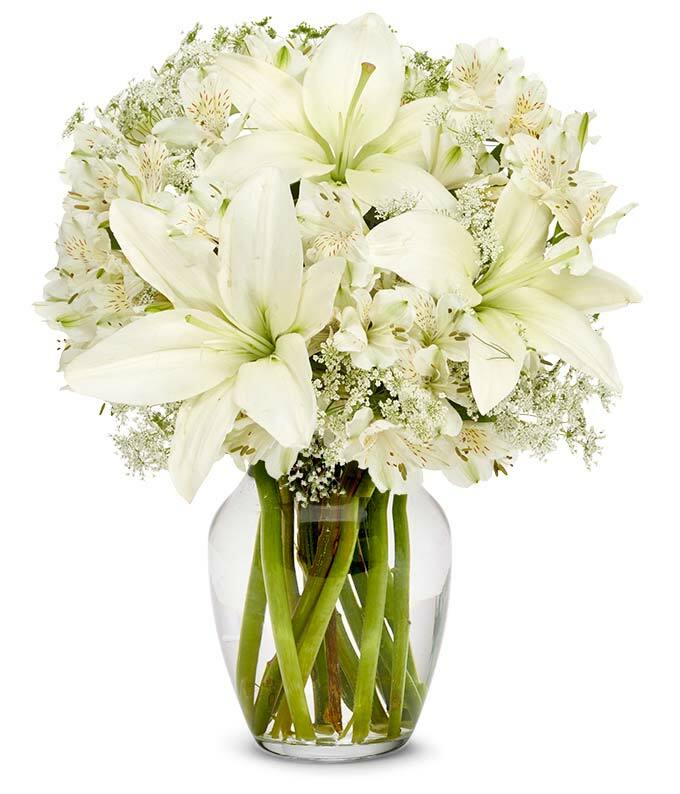 Available in three sizes, the deluxe and premium sizes also feature lovely white Asiatic lilies. A free card is included for you to personalize a message and you can also add on a sympathy banner with words of your choosing. This spray is sure to convey your sentiments during a difficult time. Express heartfelt sentiments with this open wreath arrangement. White carnations, cushion poms, and monte casino blooms are beautifully combined together. The flowers are arranged by a local florist on a wire easel and is topped off with a large white ribbon. This is available for same-day delivery and the deluxe and premium sizes also incorporate white roses. Personalize this standing spray further by adding a custom sympathy banner. 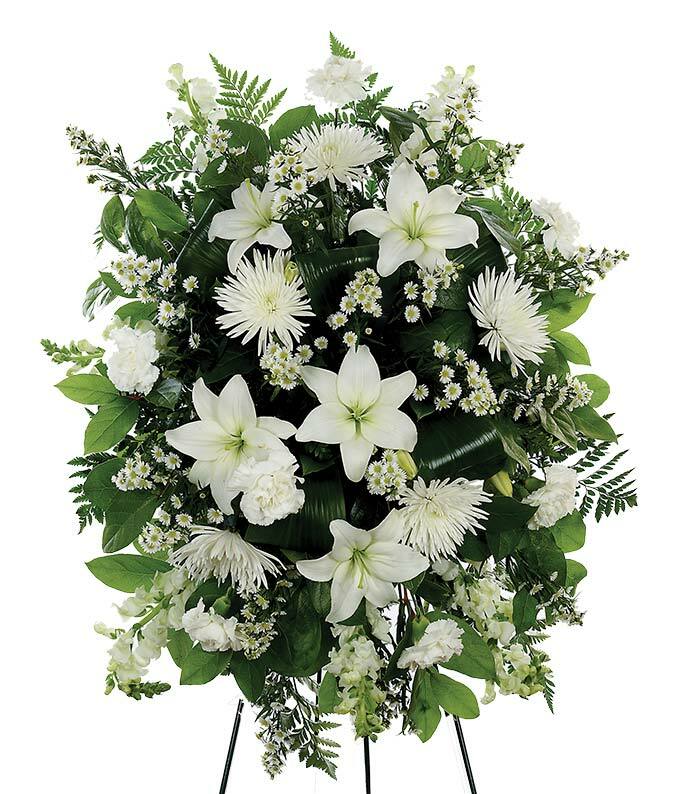 Funeral floral bouquets should be delivered to the home of a family member or friend of the deceased. Usually these are small to medium sized bouquets, which can be placed on end tables or used as centerpieces. And while white flowers are typically sent, colorful flowers that are elegantly arranged, may be sent to symbolize the celebration of the life the deceased had. Funeral floral bouquets are customarily sent by business associates, co-workers, friends, and acquaintances of the deceased. 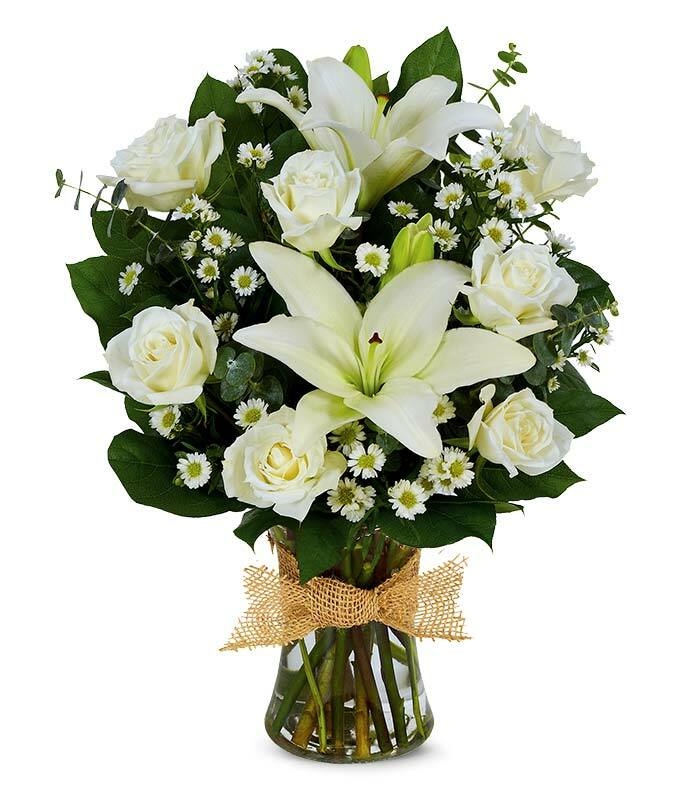 Convey your love and sympathies for the deceased with this beautiful white bouquet. 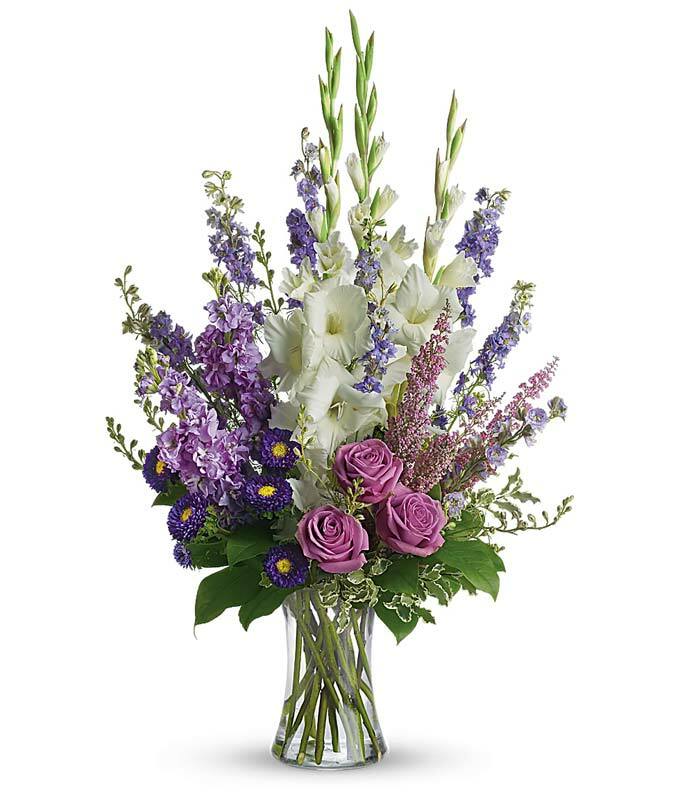 Asiatic lilies, monte casino blooms, and roses are arranged by hand with lush lush greens. The flowers are placed in a clear glass vase, and adorned with a natural raffia ribbon. This is available for same-day delivery and in three sizes to choose from, and sure to symbolize your eternal love. 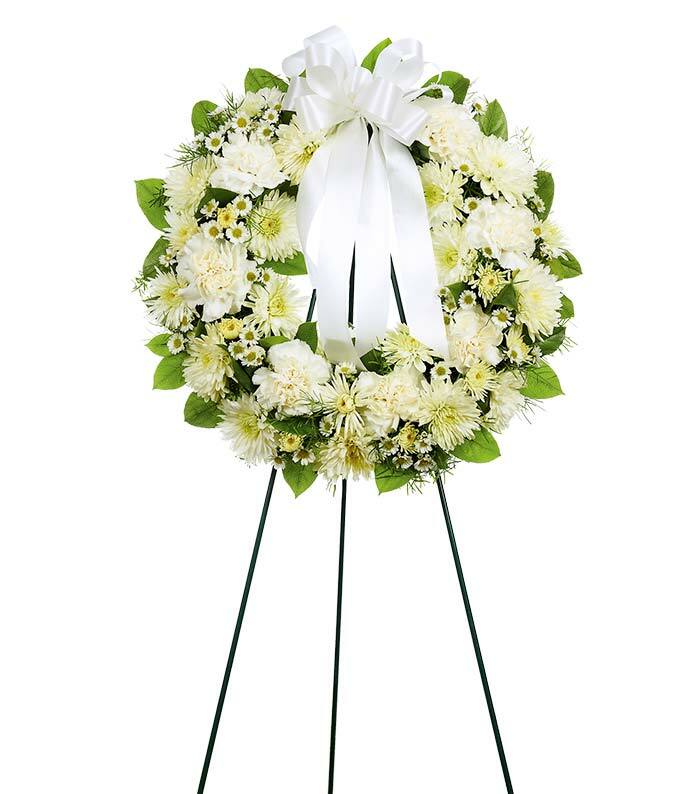 Honor the deceased with this elegant all-white bouquet. White alstroemeria, Asiatic lilies, and Queen Anne&apos;s lace are combined with a graceful bouquet. The flowers are hand-arranged by a local florist and can be delivered the same day as ordered. This floral arrangement is sure to send peace during a difficult time. For a bouquet with a bit of color, this makes for an elegant choice. Deep purple asters, lavender larkspur and roses, pink heather, and white gladioli are artfully arranged together by hand. The flowers are accented with lush greens and placed in a clear glass vase by a local florist. This floral bouquet portrays beauty and grace and beautifully symbolizes the happiness and joy the deceased brought to everyone&apos;s life. 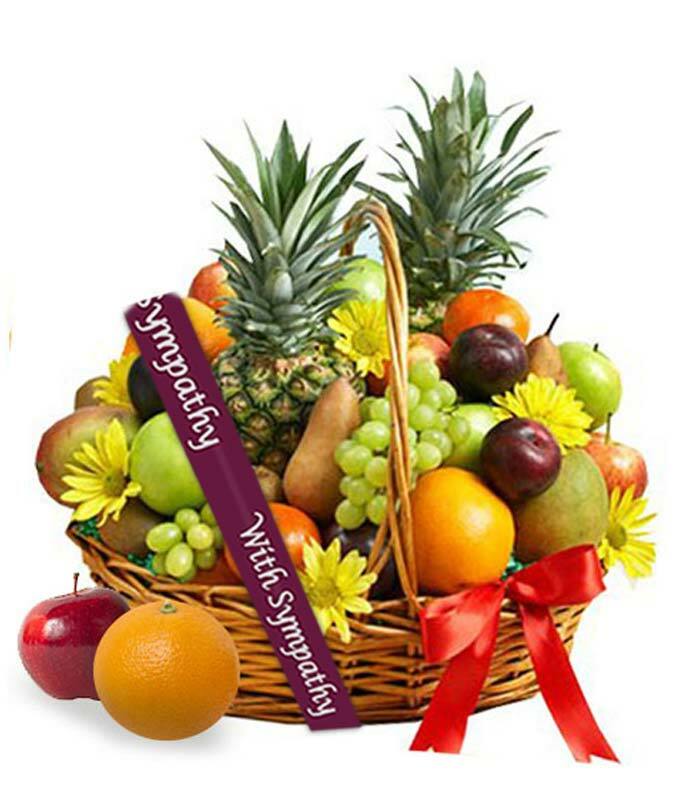 Funeral gift baskets are a great and useful alternative to sending floral arrangements. When going through the loss of a loved one, eating, let along preparing meals, may be a hard task. It is important, however, to remember any allergies or dietary restrictions prior to sending a gift basket, and for that reason fruit is generally a safe way to go. These can be sent by just about everyone from family to friends to neighbors to co-workers. 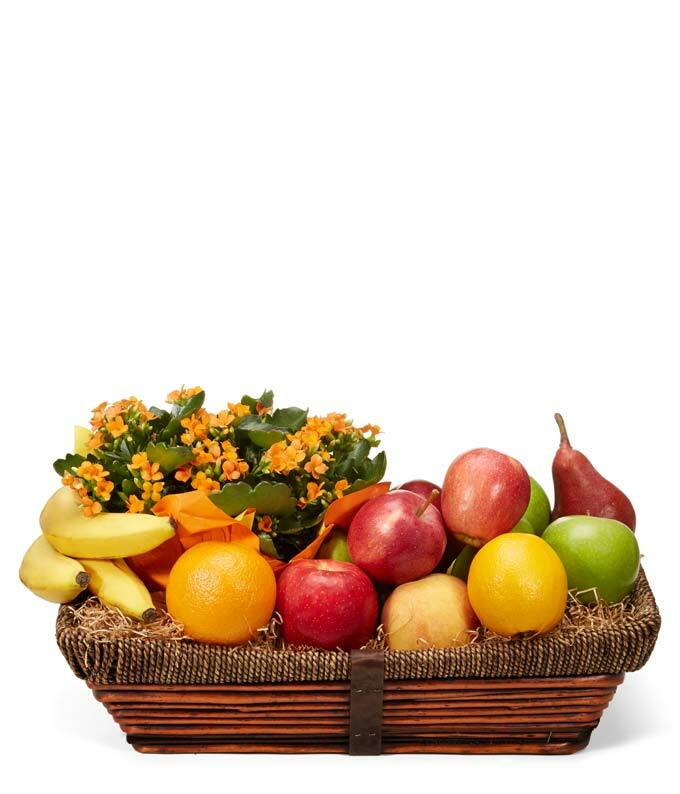 Send your sympathies for a recent loss of a loved one with this fruit basket. Fresh fruit such as apples, grapes, oranges, and pears are some of the seasonal fruit included in this thoughtful gift. The contents are delivered in a keepsake wicker basket, which is adorned with a red bow, and includes a "with sympathy" banner as well. If you are looking for a gift basket that serves two purposes, then look no further. A variety of fresh and seasonal fruit is hand-arranged in a wicker basket, which is sure to be enjoyed. Also included in the reusable container is an orange kalanchoe plant that will bring beauty and peace to your recipient. This is a gift that is sure to convey condolences and respect for the deceased and his or her family.